How much does it cost to travel to San Diego? How much money will you need in San Diego? $162 is the average daily price for traveling in San Diego. The average price of food for one day is $33. The average price of a hotel for a couple is $180. Additional pricing is in the table below. These average travel prices have been collected from other travelers to help you plan your own travel budget. How expensive is San Diego? How much money do I need for San Diego? For many visitors and locals alike, San Diego is a paradise. Located in southern California, not far from Los Angeles, it has the perfect climate, wonderful beaches, and a culturally rich environment. It's surrounded by beautiful landscape and has a strong focus on wildlife conservation and eco-friendly living. Home to about 1.3 million residents, it is California's second largest city. It also has many universities, a large tech industry, and a thriving economy. Despite its size, many people perceive San Diego as a slower, more relaxed city with a pleasant vibe away from the chaos of a large city. San Diego's climate is ideal almost any time of the year. Coastal temperatures hover around 75 degrees Fahrenheit throughout the year and humidity stays low. As you head inland away from the coast, temperatures can change dramatically. During the summer the temperatures can rise noticeably and during the winter the inland areas are much cooler, particularly at night. May and June experience the most clouds and overcast weather. September is the hottest month and September and October have the highest risk for wildfires. San Diego is a great city to explore with many interesting sights and a wonderful atmosphere. Top sights in the city include Balboa Park, Sea World, La Jolla, the San Diego Zoo, Point Loma Lighthouse, and Mission San Diego de Alcala, among others. In La Jolla you can visit the Birch Aquarium or see the Harbor seals at Children's Cove. Popular museums around town include the San Diego Maritime Museum and the USS Midway Museum. Many visitors also like to make the trip to Coronado to see the Hotel Del Coronado. This hotel was built in the 1800s and sits right on the beach. There are many shops and beautiful beaches that you can enjoy. San Diego has many different neighborhoods, each with its own vibe and atmosphere. San Diego's downtown area has a vibrant nightlife and business district. 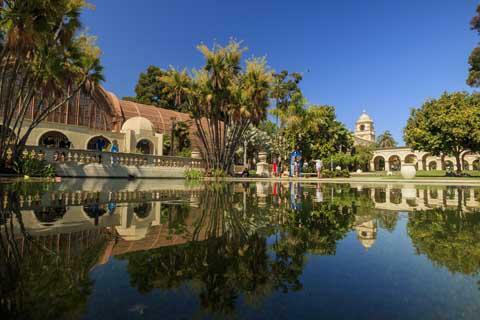 Balboa Park is where you'll find the San Diego Zoo and many museums. It also has some interesting residential areas. The Old Town area was the site of the first Spanish settlement in California and Point Loma is a great area to explore the coastline and look for sea life. Also consider making a trip to the upscale area of La Jolla, which is quite beautiful and has a nice aquarium worth visiting. San Diego is a great place for outdoor activities, cultural events, and excellent shopping. While you're in town you can relax on the beach, go whale watching, try your hand at surfing, or enjoy some boating or sailing. The weather is almost guaranteed to be pleasant and nice for any of the best things to do in San Diego. If you're an adventurous spirit, you can try scuba diving, hang gliding, or rock climbing. Hiking or biking opportunities are also plentiful. If you've had enough of the outdoors, then beer tasting in San Diego is also a popular past time. As a large city, San Diego offers endless culinary options. There are a wide variety of ethnic restaurants throughout town. In addition to local flavors, there are major chain restaurants in many different neighborhoods. Local food often includes fresh seafood, which is an excellent option. Mexican food is also delicious, affordable, and authentic. You'll find many Mexican restaurants in the city's Old Town, but they are also common in most other neighborhoods around town as well. If you happen to be in town on a weekend, allow plenty of time for your meal as restaurants can become quite crowded. San Diego is also known for its craft-brewing scene. Local brewers in the area include AleSmith Brewing Company, Stone Brewing Company, Green Flash Brewing Company, Coronado Brewing Company, Ballast Point Brewing Company, and Port Brewing Company. The public transit system in San Diego is lacking, and you would definitely benefit from having access to a car. There is a trolley system that predominately serves tourists, but the schedule can be infrequent and inconvenient. The trolley system has the blue, green and orange lines. The Blue Line runs from the US and Mexico border to Old Town via Chula Vista, National City and Downtown. The Green Line connects Old Town east to Santee, passing through Mission Valley and SDSU. The Orange Line connects the cities of El Cajon and La Mesa with Downtown. There are also city buses, but they do not cover large areas of the county and their service is also infrequent and inconvenient. Biking is another alternative if you don't have access to a car, but you will be limited in the neighborhoods you will be able to visit, as some are spread out or far away.